Sony’s E3 keynote is in progress and we are expecting some big news from it. Well our wish was granted. 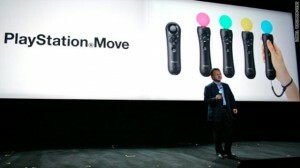 Playstation Move, Sony’s upcoming motion control add-on was finally priced and also a release date was given. Move will be available in the US from September 19th. Playstation also confirmed the rumor that Playstation network will be charging about $50 per year and is called Playstation Plus. About the Move, the controller is not just one piece of hardware. It is being sold as various components that you can add on to. Bundles are offered by Sony to get the controllers and its components. The controller itself will cost $49.99 while the subcontroller will cost you $29.99. The controller can also be purchased with a Playstation Eye camera and a copy of Sports Champions for $99.99. This is also bundled for folks without a PS3 can bundle it with a PS3 Slim for $399.99. According to Sony, since it revealed the Move, over 40 developers have been working on Move games. A few included EA’s Tiger Woods PGA tour 11 and Sorcery which is a new wizard-themed action game where you move the controller around like a wand, casting spells and attacking enemies which sounds like fun. Playstation plus will let you get access to free, full PSN games which you can have access to as long as you are subscribed to the network. The access will also let you have exclusive and early access to demos and betas. You can also pay $17.99 for three months of service as opposed to $50 yearly plan. How the PS3 community will react is still unknown but it is clear no more freebies for PS3 gamers! Sony Playstation App for iPhone and Android Soon!